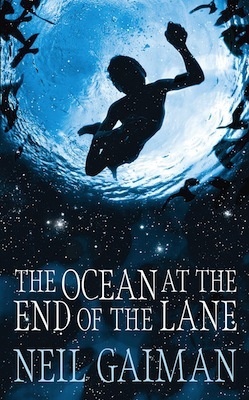 I’m not sure where to start with Neil Gaiman’s The Ocean at the End of the Lane simply because I loved it. I’ve only read one of Gaiman’s other novels (Neverwhere, after listening to the radio play version on Radio 4 – both were fantastic) and so I was eager to explore his other novels. My sister received The Ocean at the End of the Lane for Christmas, read it in 2 days and gave it a glowing review, so she lent it to me to read. The Ocean at the End of the Lane begins when a man returns to the farm at the end of the lane he grew up in. When he returns, the memory of the farm and what happened when he was a child is uncovered: it all began when the lodger commits suicide in the family car, ushering in strange, dark creatures that hail from far beyond our world to wreak havoc on the world as we know it. The young narrator struggles to survive but the three powerful women living in the farm at the end of the lane do everything in their power to protect him. Neil Gaiman creates a wonderful, fantastical world which has been on my mind for days after finishing the novel. It’s got fantastic depth, and I feel that rereading it will only improve the story, particularly as I get older, influencing my perception of the events and their meanings. The act of reading this novel took me back to reading as a child and reminded me why I love reading. I read the novel wholeheartedly believing every element of the story – I just let myself sink into it – feeling the young boys fear, his sense of injustice, his friendships, and I was eagerly turning each page to see what would happen next. I wanted to savour each word because each helped to deeply create this believable world. In some ways, The Ocean at the End of the Lane is reminiscent of a children’s novel, but it is marketed as being for adults. As I mentioned before, I think age improves this novel but I can imagine reading this when I was slightly younger and enjoying it just as much, but perhaps in a different way. Throughout the novel, Gaiman cleverly weaves the innocence of childhood with the wisdom of the old which is what makes this book so appealing for adults but still manages to retain childlike qualities. I’m struggling to categorise this book: it’s not adult, young adult, or children’s; it’s not pure fantasy, magical realism, or myth. Instead it seems to sit on the periphery of categories in a world and genre of its own. The novel is about many things: memory, fear, danger, monsters, childhood, friendship, love, sacrifice, and family, and the combination of these makes for a heartfelt and engaging read that resonates long after the novel is finished. The ending is particularly resonant, and makes me rethink certain parts of the novel and gives it a dreamlike quality where I can’t be sure exactly what did and didn’t happen. In fact, the entire novel has a magical, dream-like quality that lingers after the novel’s close. I can’t review this book without mentioning the Hempstock women who, really, are at the centre of this novel. They are brilliant characters, crafted by the expert hand of Gaiman into characters that seem very real. That’s not to say that the other characters weren’t memorable or well-crafted – the unnamed narrator’s parents had that distance and mystery about them that is reminiscent of a child’s perception of his parents (but my age made me see certain scenes and characteristics in different ways to the seven year old boy), and the dark creatures were menacing and foreboding, hanging over the book since their introduction. I can’t recommend this novel enough: it was a rich, compelling, resonant, and highly enjoyable read. Have you read The Ocean at the End of the Lane? What did you think of it? Have you read any other of Neil Gaiman’s work? © Gemma, The Perfectionist Pen, 2013 - 2015. Unauthorized use and/or duplication of this material without express and written permission from this blog’s author and/or owner is strictly prohibited. Excerpts and links may be used, provided that full and clear credit is given to Gemma and The Perfectionist Pen with appropriate and specific direction to the original content.